Valentine’s Day is a holiday that celebrates love. It began in honor of one or more early Christian saints named Valentinus. Valentine’s Day was first associated with romantic love by Chaucer when he wrote a poem in 1382 to honor the first anniversary of the engagement of King Richard II of England to Anne of Bohemia. 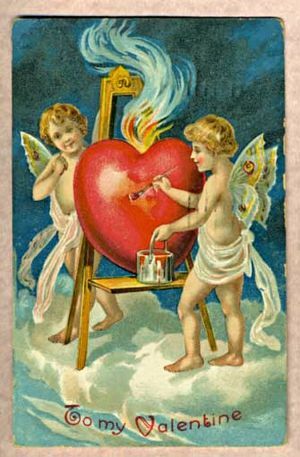 By the 15th Century, lovers would give each other flowers, candy and cards (which were known as Valentines. Then there was Hallmark…and the rest is history! Valentine’s Day celebrates many types of love. According to psychologist Elaine Hatfield, there are two main types of love: Compassionate Love and Passionate Love. Compassionate love features mutual respect, attachment, affection and trust. Passionate love is filled with intense emotions, sexual attraction, anxiety and affection. Ideally, passionate love, which is transitory and short-lived, turns into compassionate love, which is enduring and long-lasting. C.S. Lewis, in The Four Loves, identifies four categories of love: Affection or storge which is fondness through familiarity, Friendship or philia which is the strong bond that exists between people who have a common interests, Romance or eros, which is being in love or loving someone and Unconditional Love or agape which is the love of caring regardless of the circumstances. But what of a parent’s love for a child…what type of love is that? Last night, I watched one of the old Leave It To Beaver episodes and I witnessed the four loves described by C.S. Lewis. In the show, little Beaver loses his lunch money several days in a row. His parents warn him that he will be in trouble if it happens again. His father gives him money to go to the barber shop to get a haircut, but when the little boy gets there, he realizes he has lost the money again. His older brother agrees to help him and, when this results in ‘the haircut from hell’, the boys try to fool their parents by wearing hats. Affection or fondness through familiarity: This is evident in the day to day interaction…Beaver’s brother is almost always willing to help him; Beaver’s mom and dad are caring and understanding. Happy Valentine’s Day! What are your plans for today? If you have young children, have fun with them…why not go for a walk, play ball, sing a silly song, draw a picture together, read a book with them. SHOW them as well as TELL them that you love them…every day. It will make a positive impact on the rest of their lives. There is still time to nominate your favorite literacy organization to win the International Book Giving Day $25 donation…please leave a comment on my post. Tomorrow we will choose the winner with Random.org. This entry was posted in International Book Giving Day, Love, parenting, Valentine's Day 2013 and tagged Chaucer, Elaine Hatfield, International Book Giving Day, Leave It To Beaver, Love, parenting, relationships, Susan Case, Valentine's Day 2013, YouTube by viviankirkfield. Bookmark the permalink. Very insightful post on this beautiful day, Vivian! I surprised my kids with homemade Valentine cards and special chocolate this morning. It was only fair after all the love notes they’ve given me! I think I’m the lucky one here. They beat me to wishing them a happy Valentine’s Day this morning when they came in my bed. Love is such an overused word. We love our family, food, stuff – no wonder people get confused. Love for children should be unconditional and it is so important that we show our love through our actions and our words. I rarely watch TV because I don’t feel the content is appropriate for any age but I really enjoy watching all the old programs – many of them have great life lessons in them. I particularly like the Waltons and Little House on the Prairie. We watched them together as a family and I really feel it positively impacted our children. I love learning new things also, Tracy. :) Glad you liked the post…the momma and baby are my daughter and grandson. :) It’s one of my favorite photos because it epitomizes how I feel about the parent/child bond. That’s make the photo even more special. Vivian, this post was a wonderful “Leave It To Beaver” set of examples that support C.S. Lewis! You surprise me with your unusual connections, and I love it. I still love them all too! So much fun. And such a break from today’s junk. Thank you, noble sir! 🙂 Glad you liked it, Erik.